You may already have experienced a classic winter situation where your car is stuck in its parking space, the wheels spinning on ice, with neighbors wondering whether you would be able to leave. You may already have experienced a classic winter situation where your car is stuck in its parking space, the wheels spinning on ice, with neighbors wondering whether you would be able to leave. If you have only ever driven Subarus, then this kind of situation is not familiar to you. If you buy a 2014 Subaru Impreza, the only compact sedan to offer all-wheel drive standard on all models, you will forget this kind of trouble. Because an all-wheel drive car, and mostly one equipped with the incredibly effective Subaru symmetrical AWD system, can go almost anywhere in winter, peacefully. When power is sent to all four wheels, you have much better traction than when the power is relayed only to the front or rear wheels. The end result is that, when you find yourself on a snowy road, or you need to go through a snow bank, or leave an icy driveway, the 2014 Subaru Impreza masters the exercise with no hesitation. For those who do not like winter, the new Impreza is a real gift. 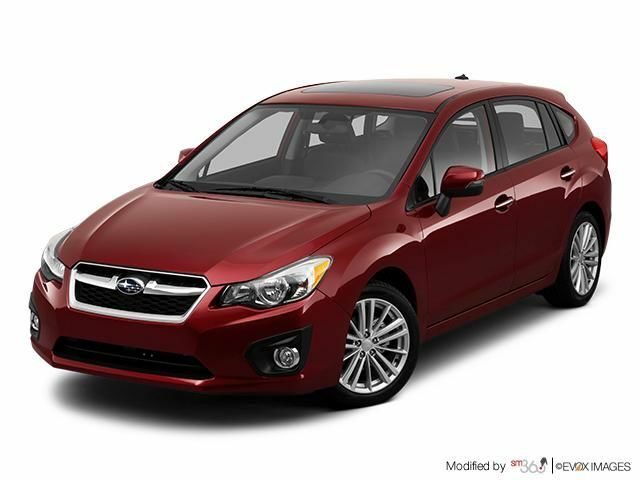 Completely redesigned in 2012, the 2014 Subaru Impreza is an unparalleled winter vehicle. That being said, the AWD adds weight to the car, which often results in higher fuel consumption. If it was sometimes the case with the previous generation Impreza, Subaru engineers have greatly improved the efficiency of the engine of the present generation. Finally, the 2014 Subaru Impreza, despite its AWD, does not consume more than most other compact cars in its class. 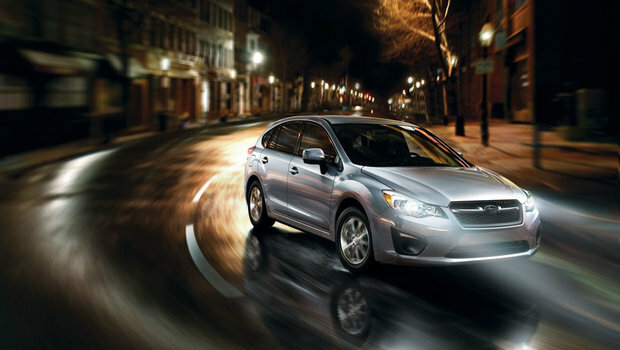 The 2014 Subaru Impreza is powered by a four-cylinder 2.0-liter engine developing 148 horsepower and 145 lb-ft of torque. Two transmissions are offered in the catalog. As an option, you can choose the Lineartronic CVT transmission that provides smoother acceleration in addition to an average consumption of 7.5 liters per 100 kilometers in the city and 5.5 L/100 km on the highway. If you compare it to other models in the same category, you will see that the Impreza is not penalized despite its winter prowesses. With the 5-speed manual transmission, the Impreza still has an average advertised fuel economy of 8.3 liters per 100 kilometers in the city and 5.9 liters per 100 kilometers on the highway. In short, the 2014 Subaru Impreza meets the needs of those who want a cheap price, but also adds hard to match extra safety. Available from $ 19,995, the 2014 Subaru Impreza offers as standard, or in option, everything one could want in a new car. Navigation system, heated seats, Bluetooth phone system, air conditioning... everything is available on one of the versions of the new 2014 Impreza. 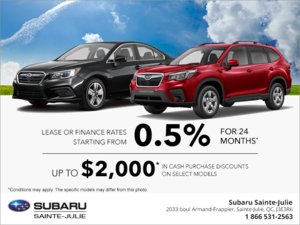 To make an appointment with an advisor or to book a test drive of a 2014 Subaru Impreza, contact Sainte-Julie Subaru today!